The last place I want to be on a sunny September afternoon is Draycote water. So there I am, at home mowing the lawn, pruning the trees, wondering if one of the Booted warblers will turn into a Sykes Booted warbler when Tom, the Terry Wogan of Tame valley birding, informs me that a Curlew Sandpiper has been seen at Draycote. I hate gardening more than Draycote in the summer so off we go. Its my worst nightmare people everywhere, mayhem. It gets surreal as a tank emerges from a farm and tarearses round the fields like a scene from El Alemein. At the hide a couple of waders are on the far shore. 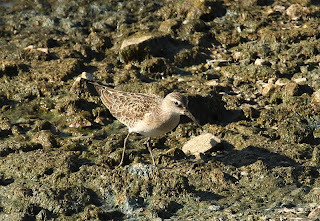 Luckily Martin is there with his scope so we're able to identify Dunlin and Curlew Sandpiper. I go for a walk round to Biggin Bay but only find a single Common Sandpiper. 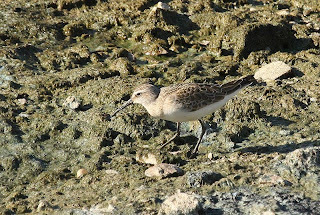 On the return around Toft a Ringed Plover and the juvenile Curlew Sandpiper are near the wall totally unconcerned by the bicycles, prams, children on roller skates and everyone else passing by. Even photographers cause little bother to the bird feeding energetically along the shore line. The walk back to the car park provides a surprising amount of birdwatching considering the number of people on site. Yellow wagtails, mainly juvs were the most numerous,adorning the hedges and dead Elms with good numbers of Lesser Whitethroats a single Common Whitethroat and a few Willow/chiffs. 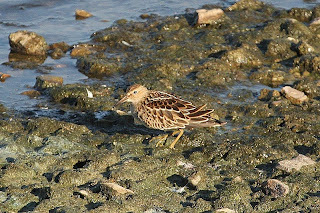 I arrived home happy to have seen my first County Curlew Sand of the year, but whats this, my pager tells me of a Pectoral Sandpiper in Toft. What? I couldn't have missed it could I? The time given on the pager is a few minutes after I left. Oh well thats birding for you. Sorts out tomorrow morning though.